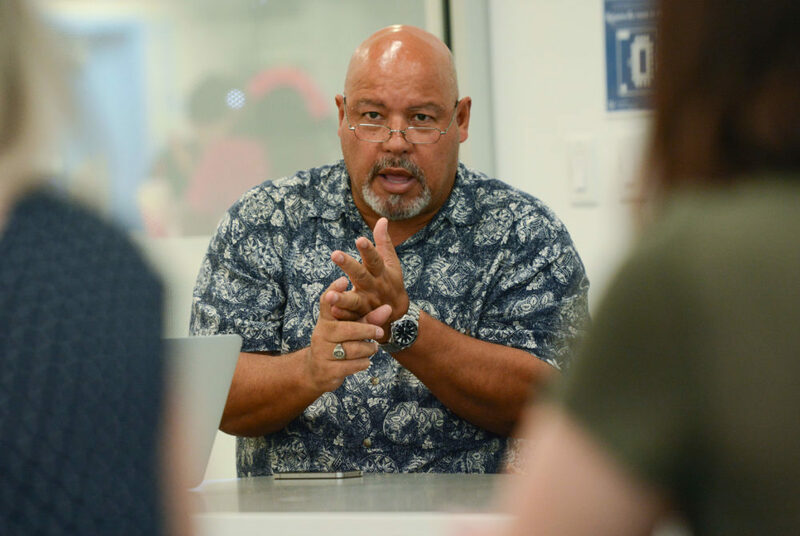 Michael Tapscott, the director of the Multicultural Student Services Center, said diversity training is often used to address issues about inclusion because it builds a foundation in cultural understanding. To address campus outrage following a racist Snapchat post, administrators, Greek life councils and student leaders have turned to a common solution: diversity training. The trainings, which are designed to educate participants about interactions with other cultures and backgrounds, will be required for incoming students for the first time next fall as officials seek to address larger questions about campus racism that emerged after the post went viral. The leaders of the Panhellenic Association and the Interfraternity Council will require new members to attend diversity training in the coming months, and the Student Association is implementing training requirements for members of the president’s staff this semester. Experts said mandatory diversity training is a step to open up the conversation about inclusion and can help students reconsider subconscious biases they may have brought to campus. But they said to change the University’s culture, larger steps – like having people of color in administrative positions – are necessary. “We have to use this moment not to focus on hostility toward individuals or groups, but as a catalyst to truly improve our community by embracing our diversity,” LeBlanc said in the statement. Officials say they don’t yet know what will be included in those trainings because they will be planned in the “coming months.” The decision came after GW’s NAACP chapter and the SA Senate called for mandatory diversity training for all students as part of broad reforms to improve the racial climate on campus. In a statement after the announcement, leaders of the black community, including Ross, commended the University’s actions but called on officials to take further steps to institute a zero-tolerance policy on racism. Michael Tapscott, the director of the Multicultural Student Services Center, which runs weekly trainings for students, faculty and staff, said the trainings focus on expanding “cultural competency” and delve into the benefits of understanding different cultures and backgrounds through presentations, role playing and problem-solving activities. He said diversity training is often used to address issues about inclusion because it builds a foundation in cultural understanding for students to use in future careers and experiences. He said the training is effective because it gets people to think about diversity and become more interested in people from different backgrounds. Experts said diversity training is often a go-to solution for universities because it’s a tangible measure administrators can implement after a racially charged incident. But they said steps to heal a community must go further than a short session. Pedro Falci, the associate director of the Howard Thurman Center for Common Ground at Boston University, said implementing diversity training is a practical first step in trying to create cultural change and it sends a broader message to students that the issue of diversity on campus is important. He said BU mandates formal diversity training – and has for about three years – because it exposes students to the best approaches to these issues. He said it also elicits more of an emotional response than a lecture or online webinar. “Hearing other folks’ stories about how they navigate this world, the challenges they may face that somebody else may not face, is really impactful and long lasting,” Falci said. Officials have sought to increase the number of underrepresented minority students on campus in recent years through measures like implementing a test-optional admissions policy and expanding scholarships and nonprofit partnerships. But in community meetings following the Snapchat incident, many students of color said the University doesn’t do enough to support them once they arrive on campus. Nationally, diversity training is widely implemented, but mandatory trainings are often not effective because students don’t take them seriously, The Chronicle of Higher Education reported in 2015. The report also cited a study in which researchers at Santa Clara University found mandatory trainings tend to change the way people think about diversity but don’t impact underlying sentiments about race. José Villalba, the interim chief diversity officer at Wake Forest University, said his university has had mandatory diversity training for incoming first-year students for the past four years during pre-orientation, a program for freshmen the week before move-in day. Villalba said incoming freshmen attend about an hour-long session led by resident advisers and student ambassadors where they facilitate a conversation about the best way to respond to a series of case studies and scenarios involving diversity. He said mandating diversity training is better than not having it at all, but that it won’t solve all diversity issues on campus, like representation. He said there needs to be a commitment to diversity across the board, which involves hiring administrators, faculty and staff from diverse backgrounds. Officials have made strides in hiring more black administrators to senior positions in recent years, but some on campus were frustrated that last year’s presidential search – which made diversity a key goal – didn’t lead to a diverse pick for GW’s president. LeBlanc also announced other initiatives earlier this month including a new anonymous bias reporting system, language in the code of conduct to address racial incidents and a requirement that the new dean of the student experience – who officials are currently searching for – have a strong record on diversity issues. “The more intentional you are about those kind of hiring and recruiting and retention efforts on the faculty and staff side, I think the better you are,” Villalba said.